1. What should be done to the further strengthen of human resource development in the context of Nepal? Write your opinion in a sentence. 2. Write down any two dimensions of sustainable development. 3. Present any one reason behind the extinct of folk songs in Nepal. 4. It is necessary to remove untouchability in practice rather than the formulation of laws alone."Why? 5. What is twelve points agreement? Write in a sentence. 6. What can be the role of government to improve tax system? Write in a sentence. 7. Mention an effort played by Nepal in regard of 'Climate change'. 8. List any four roles can be played by the provincial government to upgrade the Human Development Index (HDI) in your area. 9. "Can Nepal achieve such ambitions sustainable development goals? Give your logics in four points. 10. Construct a four line Nepali folk song which you like. Which folk instruments are used for that song? Name any two folk instrument used. Give a reason to use those instruments for that song. 11. In spite of many non-governmental organizations are working to solve the social problems in Nepal, those problems are still existing. What do you think about it? Express your views in four points. 12. Identify the impacts about the provision of Right to Reject vote (NOTA) in Nepal after its implementation. Write in four points. 13. What sorts of climate, natural vegetation and life-style did your experience while you were in a tour from Terai to mountain region of Nepal? Show in a table with reasons. 14. How does distance from sea affect on climate in Nepal? Write with examples. 15. Imagine you have got an opportunity to make a tour at "Shaheed Park" - The Sukhani Assassination place, now prepare a draft of a news story comprising the assassination and its place. 16. Prepare a news for a newspaper comprising the present condition of use and utilization of clean note in your community. 17. Mention the criteria to receive the UN membership. 18. Why do you consider the constitutional provisions related to register political party in Nepal appropriate? Mention your analytical opinions in points. 19. Draw a full page map of Nepal and insert the following facts using appropriate symbols. Draw the map of North America and fill up the following facts there. 20. Clarify the background of Referendum, 2036 B.S., activities of Panchayat System and role of political parties in Referendum. 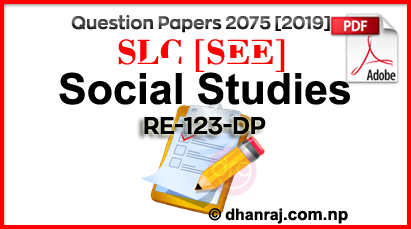 0 Response to "Compulsory Social Studies Question Paper | 2075  | RE-123DP | SEE"